If you are planning to visit Korea, this travel guide will cover all the essential things to make your trip smooth. Get a headstart in making your South Korea itinerary by knowing about the attractions and things to do in Seoul. Information about Korean visa requirements, flights to Seoul, as well as SIM cards in South Korea are provided below. Backpack your way in South Korea on a budget. Read on further for tips. This primer summarizes our Basics section. For your convenience, booking links for travel essentials and experiences are provided below. These airlines are popular among Filipino tourists who visit Korea since they offer relatively low-cost flights to Incheon, which is the gateway to the K-country. The flight schedule above is from Jetradar, which is a flight search engine like KAYAK and Skyscanner. By selecting any of the options above, you should be taken straight to the ticket vendor’s portal or airline company’s website to do the purchase. Of course, these airlines also offer discounted flights to Seoul via their respective seat sales. If you want to spend less like we do, watch out for fare promos, which are announced every so often in the airlines' Facebook pages. Here are the links: JejuAir, Cebu Pacific, Philippine Airlines, and AirAsia. If you want to be in the center of shopping and trends, book a room in Myeongdong. Some nearby Myeongdong attractions include the N Seoul Tower, Namsangol Hanok Village, Namdaemun Market, Namsan Park, and Deoksugung. Accessibility to subway station: Just three (3) minutes away from Euljiro3-ga Subway Station! Ekonomy Hotel Myeongdong Central is a hostel that's only a 5-minute walk from Euljiro 1-ga Subway Station. The property's most suitable for travelers who want a decent and stylish accommodation without spending too much. Modern rooms with stylish interior. Equipped with a flat-screen TV set and a private bathroom. In their listing at Booking.com, it is noted that "solo travelers particularly like [this] location — they rated it 9.2 for a one-person stay!" Itaewon is increasingly popular among foreigners who are looking to get into Seoul's global and local culinary scene and wild nightlife. Key attractions in Itaewon are National Museum of Korea, Leeum Samsung Museum of Art, Itaewon Bugundang History Park, and the War Memorial of Korea. Imperial Palace Boutique Hotel is a stylish accommodation in Itaewon. Designed for business and leisure travelers alike, guests will enjoy their clean and premium rooms, glass bathrooms, mobile phone rental, and business center. P.S Guesthouse is a mid-range hostel in Itaewon that's popular for its staff's hospitality and tourist-friendly service. Room types offered include a dormitory (shared for females) and private rooms with their own bathrooms. This hostel in Seoul offers air-conditioned dormitories with shared facilities. If you're looking for a convenient and cheap accommodation in Itaewon, check out SP@ Itaewon Guesthouse, which is very near pubs and restaurants. Mapo-gu is known for its youthful and romantic vibe, specifically the area in Hongdae where urban arts and indie music thrives. The Mapo district's most famous point is the Hongik University Street, which is perfect for shopping, dates, entertainment, and chill nightlife. Chic and Instagram-able rooms await you at Here House Hongdae Apartments. Aside from being posh and fully-equipped, the property is very near shopping outlets and cafés too. Almost perfect hostel in Seoul! Hongdae Style Guesthouse is a cozy and fuss-free hostel in Seoul. The homey and intricate design of the place makes it stand out as a mid-range accommodation in Hongdae. Aside from being a K-POP inspired guesthouse, this hostel in Seoul boasts new facilities and warm atmosphere. Hongdae Nanu Guesthouse KPOP also offers a large dormitory, which solo travelers or groups of friends and family can easily book. Gangnam is where the trendsetters are. It's very common to see skyscrapers, luxury boutiques, and arts center in the area. If ever you're in the area, make sure to visit the Olympic Park, SMTown coexartium, and Lotte World Tower. Glad Live Hotel in Gangnam is found in a very strategic and convenient location, just 200m away from the Eonju Subway Station. The main Gangnam strip, where culture and food leave tourists in awe, is just one subway station away. Guests who have stayed in Glad Live Hotel Gangnam noted the property's cleanliness and warm hospitality. This unassuming yet cozy-looking hostel in Gangnam, South Korea provides decent accommodations for travelers looking to explore the Jeongreung Shrine, Hangang Park (Han river), LG Art Centre, Coex exhibition, and the Gangnam Finance Centre. Rates are cheap, and various room types are available, i.e. private rooms and dormitories. One of the cheapest places to stay in Gangnam! YaKorea Hostel has dorm rooms (shared and women-only) that only has 4 or 6 beds. Most guest leave a "great location!" or "great value for money!" for their hotel review. Once you have finalized your flight to Seoul and room bookings, consider getting the following travel essentials to make your trip smooth. These items are popular among travelers since they make trips hassle-free and convenient. T-Money is a rechargeable e-money card (or keychain, among other forms) that's used by Koreans and foreign tourists to pay for their transportation fares and small purchases. It comes in various designs, such as Amazing Pay, BTS, or Line Friends. T-Money users enjoy discounted subway fares (less ₱4.5 or $0.09 per ride) and get to save some time from having to buy-single journey tickets. Buying and topping up is straightforward and may be done in subway stations (self-service kiosks) and convenience stores (over-the-counter). To get your T-Money in Korea, proceed to the transportation center of the airport (railroad) and find the machine with the T-Money logo. A card alone usually costs ₩4,000 (₱142-165 or $2.7-3.2), and you'd have to top it up first before using it. Alternatively, you may also go to a convenience store (CVS) in the airport to buy and load your T-Money. If you wish to book your KTX train ticket to go to Seoul station from Incheon International Airport (43-minute ride! ), you may do so online. This is recommended if you want to get a discounted fare and/or if you wish convert your money to Seoul station, which offers higher exchange rates than Incheon's foreign currency booths. Klook sells a one-way AREX Incheon Airport Express Train One Way Ticket at around ₱385 or $7.2. The 5-day KT Olleh unlimited data SIM plan starts at ₱1,300 or $24.3, if not less. You can click on the button below to see if there are discounts available that's offered by Klook. Daily Korea wifi rental rate is ₱424 or $8, if not discounted. If you're thinking about visiting as many palaces, museums, and attractions in Seoul, get the Discover Seoul Pass. This not only gives you automatic admission to at least 35 attractions, it will also give you discounts to other establishments in and around Seoul. Furthermore, if you purchase the Discover Seoul Pass, you won't need to buy a T-Money card since it already functions as one. Discover Seoul Pass comes in 1, 2, and 3-day variants. To see the list of attractions in Seoul that you can visit with this pass, read our guide here. Price starts at ₱1,900 or $35.6, if not discounted. 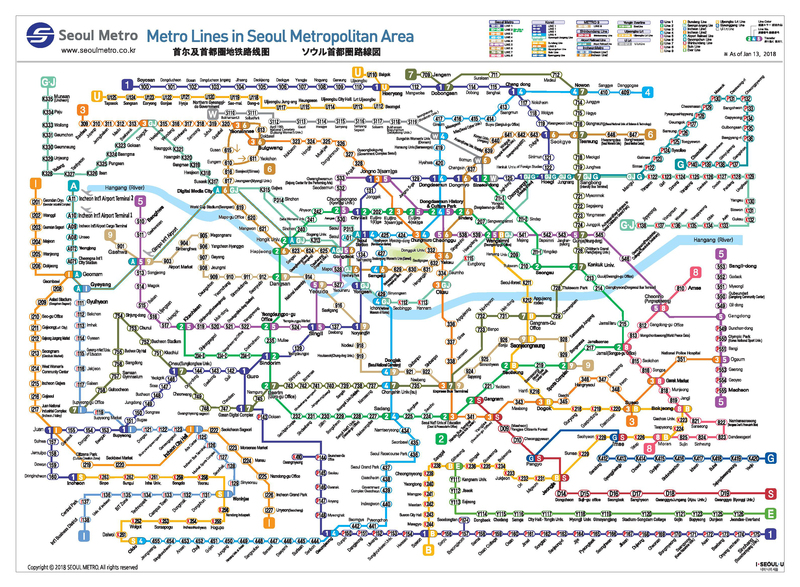 To easily find your way in Seoul, download the Subway Korea App, which features a map of the Seoul subway network, train schedule, and estimate fees. Foreign exchange booth near Hongik Univ. station. We'd highly recommend to get your Korean won when you're already in Korea. Don't bother exchanging your Peso or Dollar from foreign currency booths in your home country. You can easily withdraw Korean won notes from a Global ATM in Incheon International Airport (or Gimpo). Alternatively, you can also drop by any money changer in the airport to convert your money, though the ones in Seoul Station or standalone booths in Myeongdong, Itaewon, and Hongdae offer much better exchange rates. South Korea can be an inexpensive destination for a vacation or holiday, despite being an economic powerhouse. With good research and discipline, you can easily spend less and still enjoy a budget trip in Seoul. Power outlets in South Korea have 2 round holes (Type C or F). The standard voltage is 220 volts at 60 hertz. If you're set on buying an adapter in Korea, prepare around ₩10,000 (around ₱500 or $9.27). Access the tower by foot, bus, or cable car ride! Price starts at ₱480 or $9, if not less. Dress in traditional Korean clothing and get your hair done in a classic braid or bun! 4-hour rental rate for traditional hanbok starts at ₱950 or $17.8, if not less. Turn yourself into the real Running Man in this activity center, which is inspired by the world-famous TV show! Tackle 6 zones, including the Running Ball, City Pursuit Battle and Maze Battle. Come together with your family or friends for an awesome time! Ticket starts at ₱760 or $15, if not discounted. Enjoy 1 1/2 hours of unique experience with high-tech visual tools! Tickets start at ₱855 or $16, if not less. While you can easily plan your visit to various Korean palaces (DIY), we'd recommend booking this activity if you'd like a guided tour with transportation. Tickets start at ₱3,650 or $69, if not less. No need to worry about the hassle of public transport after the tour. Convenient drop off service is included. Night tour ticket starts at ₱2,610 or $50. Ticket starts at ₱1,890 or $36, if not discounted. Day pass starts selling at ₱2,610 or $48.9, if not discounted. Street food tour starts at ₱2,140 or $40, if not discounted. Your itinerary is totally flexible: simply board the Nami Island shuttle bus in central Seoul at 9:30am and hop back on at 4:00pm to depart from Nami Island. The rest of the itinerary is up to you! Ticket starts at ₱1,300 or $24.32, give or take. Enjoy numerous rides and attractions at one of the world's largest and best theme parks. Regular ticket (non-Early Bird) starts at ₱2,590 or $49. If you don't have a Klook account yet, you may sign-up using my referral code to get instant credits for your first booking. Click here to create an account. Note that for families intending to apply, prepare to submit all applicable marriage and birth certificates to prove your familial ties. Once the requirements for Korean visa are secured, applicants must then contact a travel agency that's duly designated or accredited by the Embassy of the Republic of Korea in the Philippines. The travel agency of your choice will be the one to submit and process your Korean visa application. They usually charge ₱800 or $15 for their service. Following are the list of travel agencies that you may contact: (To know their addresses and contact details, you may refer to our directory here: Applying For Korean Visa Through an Accredited Travel Agency). If you are unable to submit any of the required documents, you may write a letter of explanation. Click here for our cover letter template. If you were personally invited by a Korean national, submit an invitation letter and photocopy of their passport or Identification card along with the other requirements. If invited by a company in Korea, submit an invitation letter and photocopy of their corporate business registration certificate. We hope you enjoy your upcoming Korea visit! Don't forget to share with us your own South Korea itinerary, tips, photos, and stories. We'd love to feature your contributions to help other travelers! For more Seoul travel guides, tips, and updates, don't forget to like ManilaxSeoul on Facebook!